It looks like I’m going to be busy with this list! What would you pair with your favorite Christmas movie? We are just over a week away from Christmas, sorry if that was a bad reminder for those still shopping, BUT it is another great holiday we get to have with loved ones…plus wine & food! Well, today we’ve got 2 white wines to suggest with some amazing sounding seafood recipes. Our family loves spending time in Cayucos, California as well as enjoying fantastic, fresh seafood, which we are blessed to get around here. These are recipes that I could very much see my family enjoying on Christmas Eve. The first is a recipe I found from Sunset Magazine last night as I finally had a moment to look through the latest issue, and I stumbled upon the Trout with Root Mash recipe. What I loved about this recipe is that it took one of our favorite summer fishes and grounded it with a wintery vibe using the root mash. This dish would pair wonderfully with a Sauvignon Blanc. The citrus and herbs used for the fish would be merry with the citrus notes of the wine and the minerality would play well with the earthiness of the root mash. I can see this being a perfect Christmas Eve dinner as it is light and would allow you to get ready for a heavier Christmas Day meal. The next recipe I found on Food & Wine is a Smoked Salmon & Celery Root Bisque. I have loved salmon bisque ever since enjoying my first bowl at Robin’s in Cambria when I was 19 (it’s also at Novo in San Luis Obispo). 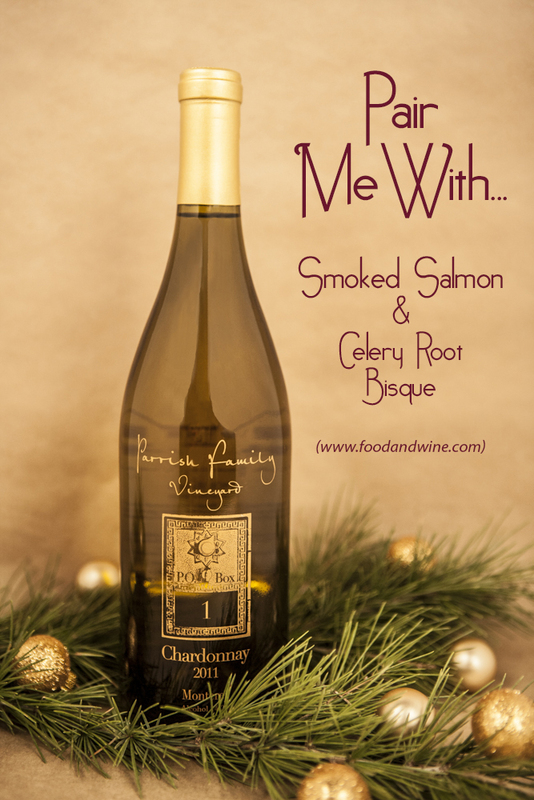 This Food & Wine recipe takes it to a different level with celery root and smoked salmon. A Chardonnay would pair very nicely with this as the butter would compliment the melt in your mouth richness of the salmon as well as work with the savory celery and parsley flavor from the celery root. I normally would pair a Pinot Noir with salmon, but the smoked salmon needs to balanced out with the citrus notes found in a Chardonnay. All you would need is a multi-grain artisan bread to complete this meal. After looking at these recipes, it reminded me not to discount seafood as apart of the holiday meals as dishes like the bisque, trout with mash, or even a cioppino can be very warm and festive. As we now head into the Christmas season, we will be putting up some food pairings for the Christmas holiday! Unlike the traditions of Thanksgiving, Christmas dinner comes in much more variety and can be different for every family. First off, we’ll start with the Petite Sriah. This wine/grape is different from Syrah and it is noticeable in the taste. Petite Sirah tends to be dark in color and bold with black fruits, plum, pepper, and powerful tannins. Although like all wines,Petite Sirah can vary between wineries, for instance our Petite Sirah has much smoother tannins. Many of you might already know this, but for those beginning in wine…for Petite Sirah it is best to stick with red meats as white meats with their more simple tastes will be out matched by the boldness of this wine. So, here are a couple of dishes that I thought would be great with our Petite Sirah as well as others. First off a classic and formal dish for Christmas is a Stuffed Pork Tenderloin. You can stuff the tenderloin with wild rice and cherries, or try a classic stuffing with walnuts and cranberries. The fruit forward qualities of this wine will go nicely with the herbs and fruits. I’d even add a reduction of pomegranate or cranberry to the top of a pork tenderloin just to help with any possible dryness. Next, since California has been abnormally cold, any comfort food that is warm sounds especially fantastic. I found this great recipe that does a twist on a French classic, Venison Bourguignon! Normally it is done with beef, but venison is a flavorful and less fatty meat! Beef and venison would both be a nice compliment to the pepper and tannins found in the Petite Sirah. I can just picture curling up with a blanket next to a nice fire with a bowl of bourguignon and a glass of Petite Sirah. Lastly, a fun dish for anytime during the holiday season is pizza. Ethan and I watched Home Alone last night and Kevin McCallister’s Christmas season is filled with pizza, which is not surprising for a kid, but the truth is that pizza is loved by just about anyone and pairs great with Petite Sirah. One recipe that stood out to me is a pizza with prosciutto, arugula, tomatoes, and shaved parmesan. It’s simple, but is a nice step up from pepperoni and cheese to make it a special dish for Christmas that you and your kids will enjoy.